A couple of weeks ago Matchmore participated in Deutsche Bahn Comfort Check-in Localization Challenge organized by DB Mindbox, an innovation lab part of Deutsche Bahn's digitalization program. Together with around 10 other actors, start-ups, larger companies as well as internal DB teams, we were selected to travel with Deutsche Bahn from Frankfurt to Berlin in order to present, test and try our solution for the Comfort Check-in in a real moving train. First of all, we want to highlight the possible location-based opportunities with our technology during the passenger's way from his/her arrival to the train station all the way to the arrival to the final destination, both indoor as well as outdoor. Using GPS, Matchmore's technology can guide the passenger from the bus or taxi stop at the train station to the main hall. If the passenger arrives by car, it would be possible to guide him/her to an available parking space, saving valuable time. When the passenger arrives at the main hall, using Bluetooth, our technology could provide indoor wayfinding possibilities to shopping or food areas on his/her way to the train. We could also guide the passenger to the right platform and wagon, or even the position of the door nearest to his/her seat, depending on the latest schedule updates. Step number 5 of the passenger's journey is when the passenger enters the train and wants to check in to his/her reserved seat, or to find an available seat in case of no reservation. This was the Comfort Check-in Challenge, and the demo app covers only this part of the journey. The final step is when the train arrives to the passenger's destination. In this scenario, Matchmore can use GPS to notify the passenger when the train approaches the destination. Based on the location on the final destination of the passenger, Matchmore could also provide valuable information about connections and time tables. Our demo solution for Deutsche Bahn consisted of a demo app, QR codes and of course our context-aware matching service. In this case, the contexts are proximity and time (the relative distance to the seat at the right time). The app can be used by passengers as well as by conductors. The solution works for both passengers with a seat reservation and for passengers without a seat reservation, such as passengers traveling with the BahnCard 100 with unlimited travel. A passenger with a seat reservation will open the app and click on "Reservation". The app will show the details related to the trip such as departure destination and seat number. In order to check in, the passenger will click on "Comfort Check-in". The passenger will scan the QR code next to the chosen seat, and if the physical seat matches the seat reservation, the Comfort Check-in is done. The passenger will receive a screen with three check marks confirming that he/she is in the right train, in the right wagon and at the right seat. If you are interested in a more detailed step by step guide of our solution for Deutsche Bahn, please read Deutsche Bahn Comfort Check-in with Matchmore - A step by step walk through (2/2). This post describes scenarios such as when the passenger is at the wrong seat, when the passenger is a BahnCard 100 traveler and when the conductor is controlling ticket reservations. There are several advantages of the Comfort Check-in, both for the passenger and the conductor. If the passenger performs the Comfort Check-in correctly, he/she will not be disturbed during the remaing journey by any conductor. Check-ins are for many people boring procedures that they would gladly skip or finalize privately at their own convenience. Thanks to Comfort Check-in, conductors will spend less time controlling tickets and more time being train hosts. With Comfort Check-in, it's possible to change the service to passengers completely – either do it with less employees or switch their focus to value-added face-to-face services that are more impressive than controlling tickets. This solution is applicable to other actors with seat reservation management as well. We can for example bring value for seat management in two areas, controlling and providing service. If you have another area where our technology could bring value, don't hesitate to contact us! Controlling seat reservations is probably where our technology can provide the most value today. Matching a physical seat and a seat reservation with our self check-in solution can be applied to any transportation where controlling the right person at the right seat must be done. Deutsche Bahn and trains is a perfect example for this, but imagine also a conference where the front rows are more attractive than the rows behind. In this example, self check-in by QR codes for the seat management is a solution for making sure the right person is at the right spot. To offer self check-in for passengers or other types of guests is highly desirable today, both from the user's perspective and from the controlant's perspective. Providing service is the second case where Matchmore's technology can achieve valuable results. As for example, imagine restaurants, event halls or sport stadiums where your ticket is associated to a specific seat and location, and it would be possible to order drinks or food through an app directly to the seat. If you want to provide a great customer experience, giving that extra service is crucial in today's competitive landscape. In the demo with Deutsche Bahn we used "low tech" QR codes to match the physical seat and the seat reservation. QR codes are cheap and can be distributed easily in any environment. However, it's also possible to use Near Field Communication (NFC) instead of QR codes for this type of use case. Thus, making the user experience even more convenient. NFC is a short-range wireless connectivity standard that uses magnetic field induction to enable communication between devices when they're touched together, or brought within a few centimeters of each other. Using NFC would save steps for the users compared to using a QR code where the users have to open the camera function in order to scan the code. Substituting QR codes to NFC brings a lot of value where the frequency of the matching between the physical object and the reservation is high. Please note that NFC is not available on our website as of today. However, we will offer NFC solutions in the near future. If you have questions regarding this, please contact us. We were very happy to be selected to participate in the DB Comfort Check-in Localization Challenge earlier this year. Our successful demo shows that we have the capabilities which is required to accomplish big things. 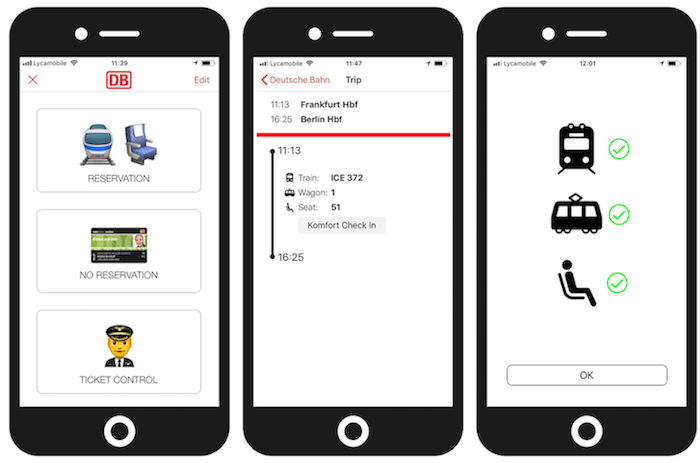 If you are interested in the full step-by-step explanation of our solution for Deutsche Bahn, please read the blog post Deutsche Bahn Comfort Check-in with Matchmore - A step by step walk through (2/2). Feel free to get in touch with us if you want to know more about our solution for Deutsche Bahn, or if you are interested in other solutions we can provide for you. You can either contact me at sofia.bjorklov@matchmore.com or my colleague Mitch at michel.demarsano@matchmore.com.